Does the thought of Cleaning your Floors have you running in the other direction faster than a Cheetah??? We used to as well! Ever since we chose to live the Green Life and eventually grew tired of all the other "Green Cleaners" leaving us disappointed... we proceeded to create this formulation and soon over came the dreaded cleaning chores! We; along with all our customers have rediscovered the joy of cleaning! 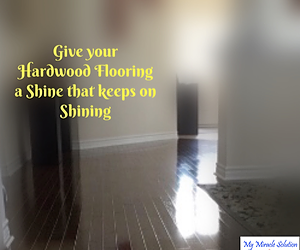 Enjoy rejuvenating your floors with My Miracle Solution, the oils seal in and nourish all your flooring and leaving behind a long long lasting shine! My Miracle Solution effectively and effortlessly cleans Hardwood, Granite, Marble, Quartz and many other surfaces. There is no repeat mopping and replacing dirty water; using a dry mopping system such as Bona or Vileda you Shake. Spray. Wipe. Breathe. and before you know it, your home or place of business has created its own personality! You can use MMS as your new grout cleaner; removing the outdoor grime form the grout will instantly breathe into your home a whole new look! Should you have manufactured flooring such as Laminate, Vinyl, Ceramic, Linoleum or Tiles; My Miracle Solution will work equally effortlessly and no changes required. The same dry mopping process used on natural floors works equally well on manmade surfaces. No fancy tools or extra steps are required. My Miracle Solution allows the user to move between flooring materials with Zero Changes made. Sit back and admire the brilliant beauty of your home, office or even your car. My Miracle Solution is set to take the world by storm!! Get your Miracle in a Bottle today!